The Don’t Quit poem has a powerful message for anyone who is struggling a bit. 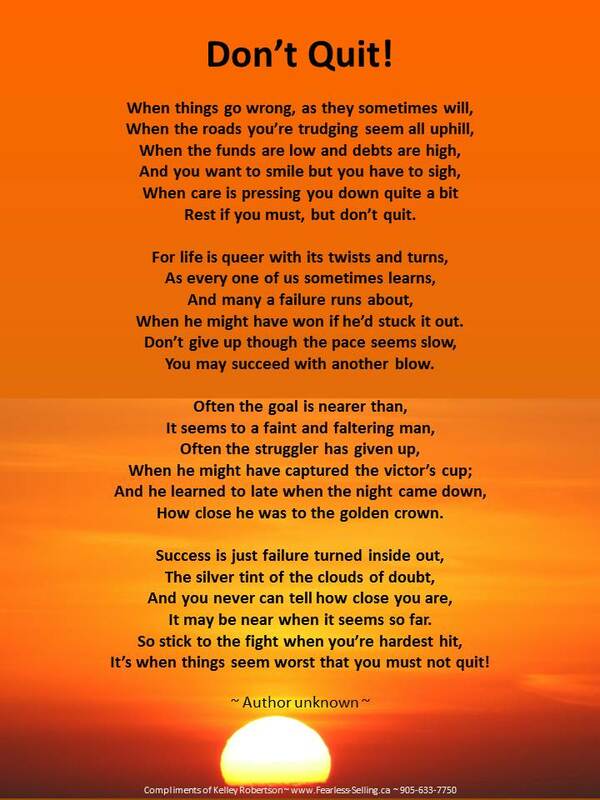 I first came across the “Don’t Quit” poem when I was at college. I put a poster of it over my fireplace in my room. What traumas I was facing at the time I do not recall. Probably something as minor as fancying someone who did not fancy me. I am an expert in shallow sometimes. The poem came back to my mind this week. Since my husband was made redundant, I have worked on blind faith. As that has not worked so far, I think we probably need a new strategy. I am not sure what that plan will be and hope Christmas will give us time to work it out. Funds are certainly low and debts are just starting to show up. Perhaps applying hundreds and hundreds of pounds to attending interviews was the wrong way to go but it seemed sensible at the time. It is interesting to note how the don’t quit poem acknowledges rest as something that may well be worth doing. Like a jigsaw puzzle where you struggle to fit the right piece and then return with fresh eyes and place it immediately, after Christmas we might return to this battle refreshed. The pace to success seems incredibly slow. It is disheartening and yet one letter or phone call could change all that. I recognise the faint and faltering man as my husband gets more down-hearted and tired. We have to stick it out. We have children – they need to be looked after. So we carry on. I think of how lonely I was and how I felt so useless not that many years ago. Along came blogging and magical experiences. I now have imaginary friends who actually exist. I did not see what a lovely journey this would be – lovely competition wins, exciting things to review, trips at home and overseas and a sense of belonging and acceptance. 2014 may mean I have to take on new challenges and make more use of the skills I have but with the help of the don’t quit poem, I will keep on keeping on. We may both be nearer than we think to being OK.
One thing is for sure with your amazing support I will not quit! January 1st always brings a certain magic with it – approach it with the right spirit and it will work for you. 2014 is going to be awesome! Prospero ano y feicidad as the old song goes. I feel that this is quite relevant to me at the moment too. I cross my fingers for you everytime I see an interview tweet from you. I really hope he finds a job soon and that 2014 will be a better year. Redundancy always makes you re-evaluate what is important. I took advantage of my redundancy and now have two beautiful boys and a digital marketing company that I wouldnt have started if I was in my old job. Sometimes your hands are tied and you need to make lemonade with those lemons.